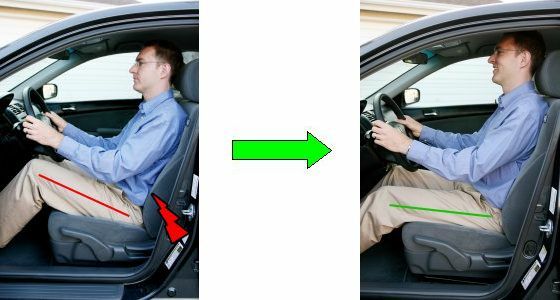 Your seat height should be set so that you can comfortably see the road and driver’s console, and your hips should be level with your knees. If you’re too low you might need to add a cushion to the seat. The seat should be reclined at an angle of 100-110 degrees, and your entire back should be in contact with the seat. Adjust the lumbar support so that it feels comfortable and supports the natural curve in your lower back. You can add a cushion if you need extra support. The headrest should be in contact with the middle of your head. The seat position should allow you to fully depress the pedals without coming away from the back of the seat. The steering wheel should be positioned to minimise how far you have to reach with your arms. This avoids putting too much pressure on your neck and upper back. Hold the steering wheel at 9 o’clock and 3 o’clock or lower. Holding it higher than this puts extra strain on your neck and shoulders. Once you have the seat and steering wheel positioned correctly adjust your mirrors to suit this position. If you get into a bad position the mirrors will encourage you to get back into the right position. When getting into the car sit down first and then swing your legs into the car. On the way out slide your legs out first and then stand up to avoid twisting your lower back. Always remove your wallet from your back pocket before sitting in the car- this will reduce extra strain on your pelvis. Avoid twisting to reach things on the back seat. Take regular breaks. On long drives get out of the car and move around every two hours. Give your body a few minutes out of the car before lifting things out of the boot. This will help to avoid back strain from lifting.